Motorola unveiled their yearly mid-range champ which is the Moto G 3rd generation. The last two generations have been highly successful and we strongly feel it will be the same with this one as well as they have included some surprise features like the IPX7 certification which none of us thought would come. They priced it around the same they did for the 2nd generation – 12,999 INR. One of the phones that will come to your mind at this price is the Xiaomi Mi4i. We have extensively used the Mi4i and also got to spend some time with the Moto G (2015) at the launch event and have some good information. Here is our quick comparison of both the devices based on certain categories which we usually look for. Please note this is not a detailed comparison but something we believe will be a fair comparison that will help you to take a very educated decision in case you are in a need to pick one device at this very moment. The Mi 4i is a thin (7.8mm) and a light (130gms) phone coming at 5 inches screen and pretty closed on the bezels is a very handy phone. It fits neatly into your hands and when compared to the taller 5.5 inch crowd out there this is much easier for a single handed use. Build is based on unibody poly-carbonate material which is basically high quality plastic. When it comes to display it has a gorgeous FHD display with 441 ppi that supports sunlight display and also Corning Scratch-resistant glass. The Moto G (2015) is more bulky (11.6mm) and heavy (155gms) but thanks to the signature curved design of the back it should not be any trouble to get used to holding this phone. This too is a 5″ screen phone but since it is slightly taller and wider, getting used to a single handed use might take a while. The build is based on plastic again but this has removable back and a metal strip. These are of very high quality and gives a unique look to the phone. One can also buy Motorola shells available in different colors and customize the look of the phone. Display here is rather 720p (HD) that packs 294 ppi but features Gorilla Glass 3 protection. The Mi4i runs on MIUI v6 built on Android Lollipop and is heavily customized with tons and tons of cool options. Xiaomi is good in pushing constant updates to the phone and there was a recent update that improved the battery life by a huge margin. Overall the OS has reached a stage where it is stable, provides good battery life and tackled the overheating issues. If you are looking for a stock android experience then this may not be your cup of tea. The Moto G3 on the other hand runs on Android Lollipop 5.1.1 which is as close as it can get to the stock Android experience. They have added few standard Motorola apps but they do not hamper your experience in any way. There are cool things like twist to activate the camera, chop twice to launch the flashlight and such which are very unique. Updates come in fairly regular and not much complaints on that front. Mi4i has the Snapdragon 615 Octa-core processor clocked at 1.7 GHz, accompanied by 2 GB RAM and 16/ 32 GB of internal memory that cannot be expanded. There is also the Adreno 405 GPU. All of this put together is more powerful when compared to the Moto G (2015) that is powered by Snapdragon 410 Quad-core processor clocked at 1.4GHz with 1/2GB RAM and 8/ 16 GB internal memory that can be expanded upto 32GB, with the Adreno 306 GPU. Mi4i and Moto G 3rd Gen have similar cameras in the form of 13MP rear camera with dual LED flash and 5MP front camera. While we have seen the camera on the Mi4i do very well, even in low light conditions we are yet to test out the Moto G(2015). But going by some initial reviews on YouTube and articles we feel Mi4i will have a slight edge. Also the cameras on the Xiaomi phones have been hard to beat as per our experience with Mi phones. 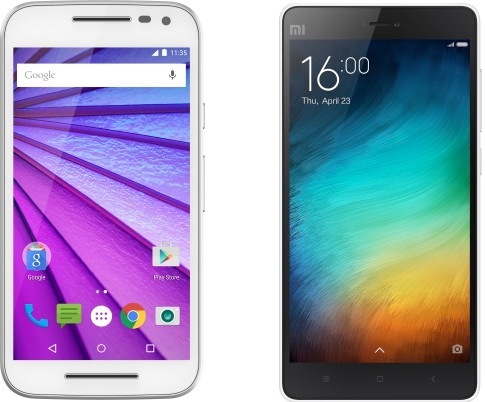 Mi4i – 16GB variant is priced at 12,999 INR and the Moto G (2015) 16GB + 2GB RAM variant is also at 12,999 INR. There are other variants also but more fair comparison of pricing is at 12,999 INR. Mi4i 32 GB comes at 14,999 INR while Moto G3 8GB + 1GB RAM variant comes at 11,999 INR. The only catch being Moto G supports extra memory and Mi4i does not. Post sales service – Xiaomi has been bringing lots of service centers but no matter what they seem to be doing, there is not much luck for customers. It has been as bad as it ever was. Motorola on the other hand has a well established chain of service centers and they do a very good job hence not much of a worry there. Battery – Mi4i has a 3120 mAh battery while the new Moto G has 2749 mAh battery. Mi4i has improved on its battery performance after recent updates and has been deliverying around 4 hours to 4.5 hours of screen on time even for above average users. Though the battery on Moto G(2015) is less powerful, the lighter version of Android should ensure that it delivers a good battery backup. If you want a stock Android experience and not a very heavy user or do not game a lot but looking for a very good camera and a bonus option of water resistant phone, all backed by a very strong after sales support – Moto G3 is the one for you. If you are looking for a light and slim phone with a gorgeous screen and a cool, colorful thick skinned UI wont be a problem, and OK with no option to add additional memory and one of the best cameras in its price range – then Mi4i is the one for you.